The city of Nantes used to be the capital of the demesne of Brittany, and even today, the Grand Duke of Brittany's palace in the center of the city has the majestic atmosphere of that age. It is a peaceful and beautiful city only two hours from Paris on the TGV. Nantes is a city known for its enthusiastic artistic activities. We were invited by the city's leading art organization, "Le Lieu Unique", to hold our Stringraphy Ensemble Concerts. 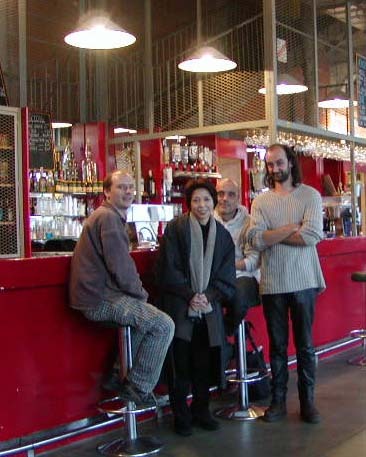 The director of this organization, who saw and appreciated our concert at the EXIT FESTIVAL held in the suburbs of Paris in March 2002, invited us to hold our concerts in Nantes in November 2002. 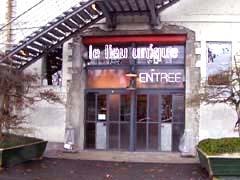 The venue for our concerts was once a cookie factory, but which was renovated into a huge "art factory". At first glance, the building looked somewhat worn down, but the facilities inside the space were devised so that various types of artistic activities, such as art exhibitions and plays, could be held. The terrace-style seats were designed so that they could be put away, and the pipes from the ceiling were installed at 30cm intervals. 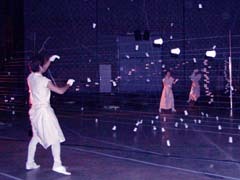 Backstage, there was also a studio where stage settings could be produced. We were overwhelmed by the eleven-meter-high ceiling, which is rarely found in Japan. But after discussing how we should install the Stringraphy, we decided to proceed with the original plan we worked out in Japan for this concert. In the center, we set up a larger-scale Stringraphy than usual, which resembled a bird's cage. It was created so that listeners sitting in various positions could enjoy the concert inside the chaotically stretched strings. 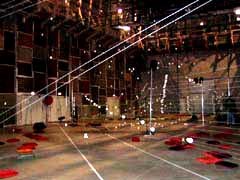 We created twenty-meter-long sets of super bass Stringraphy strings that stretched in all four directions, which were aimed at creating a resonance like that of the chanting of Buddhist hymns. Therefore, the atmosphere was quite different from the concerts we did in March, in which Stringraphy was set up on the floor below the stage of the theater. 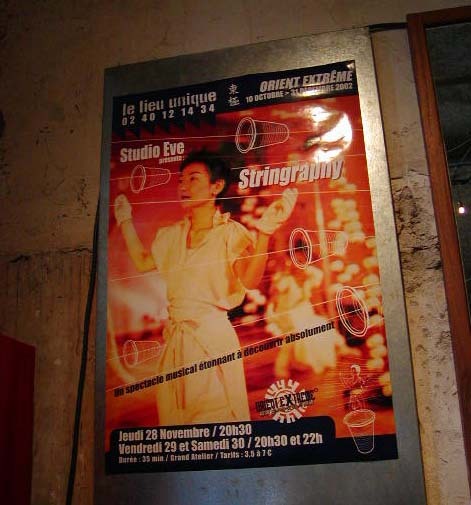 One of the amusing elements about Stringraphy is that it is a site-specific instrument; thus, it can be set up in any type of space. 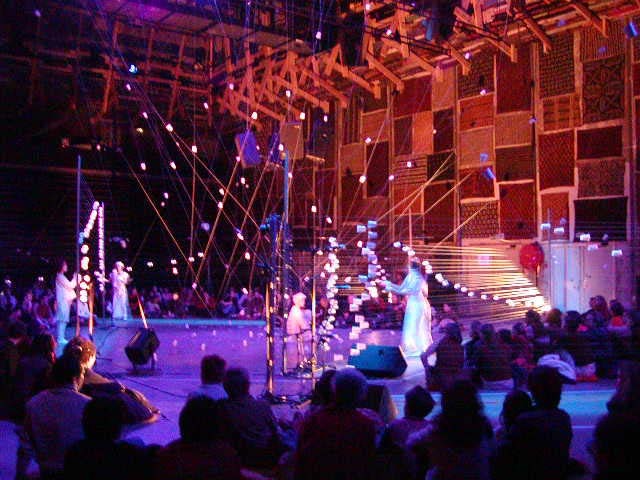 When the Stringraphy was set up, the paper cups and silk threads appeared under the black-lights, while also creating an illusory atmosphere. In this atmosphere, people sat wherever they pleased inside the stretched strings and enjoyed our concert. The organizers made a request for us to play the same pieces that we played in March in France. It was a forty-minute concert composed mainly of pieces created by Mizushima. After performing the first concert, we received a long, storming round of applause; thus, we decided on the spot to add "Akatonbo" ("Red Dragonfly", a traditional Japanese children's song) from our second concert in response to the encore. Therefore, we ended up holding fifty-minute concerts. 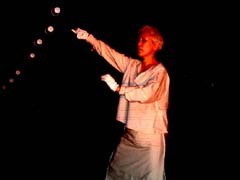 The bodily movements of one of the members, Kikuyo Nakamura, especially attracted the attention of the audience, perhaps because her movements conveyed a feeling of Butoh dance. French people, who truly love art and are known to give scathing criticisms, gave us their unfailing, boisterous applause, which allowed our members to gain great confidence toward our own performances. This opportunity became one of our most precious experiences.